Today's guest post was authored by James Brown (Twitter: @skilljim, YouTube: youtube.com/theskilljim). Thanks to James for the great write-up! 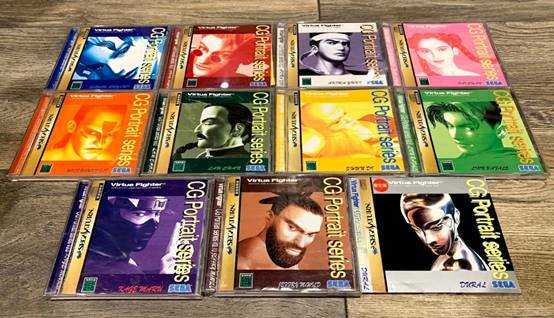 Back in 1995 Yu Suzuki with his AM2 team and SEGA released a 10-disc series of stand alone SEGA Saturn discs called the Virtua Fighter CG Portrait Series. 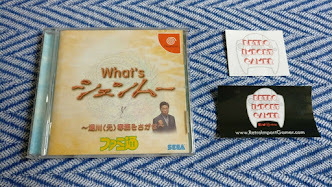 Each of the discs contained computer-generated art and a unique music track, some even featuring vocals from the iconic Daytona singer himself, Takenobu Mitsuyoshi! Each disc focused on one specific Virtua Fighter character, and there was also a bonus 11th "not for sale" disc that was based on the character Dural (and could only be obtained in exchange for sending the spine cards of the previous 10 discs to Sega). Each of the discs feature a wealth of fantastic early 3D concept art that still looks great today - a testament to Yu Suzuki and his vision for realism. Related post: A Visit to The Forbidden City | A Look Back in Time to Predict the Future! Looking at the 10 discs in particular, whilst you could find connections to most of these Virtua Fighter characters and who their Shenmue counterparts were based on, I want to focus on some of the more obvious ones before speculating on some of the more obscure unknown ones. Please note that all comments are purely speculation, based on similarities spotted. 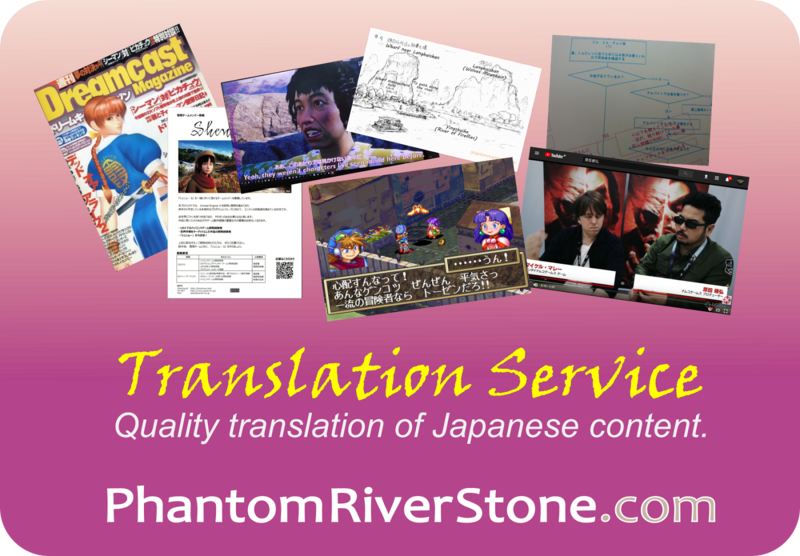 Here you can clearly see the connections to Ryo's early design. If you had seen the Shenmue SEGA Saturn footage, here Ryo is jacketless and features these iconic wristbands as Akira is wearing in these images. Some very familiar images indeed with Akira with his green backpack, down by the harbor with a large ferry in the background! Akira at the harbor with his green backpack. Images with farm animals, such as goats and chickens are representative of animals of rural China (perhaps Shenhua's home in Bailu Village?). Bailu Village? 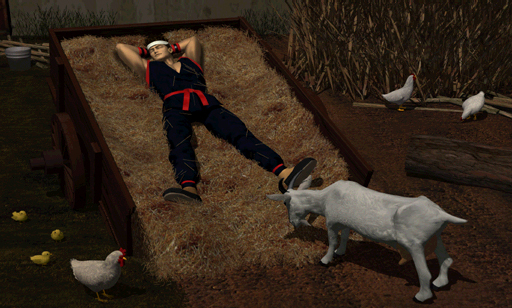 Akira takes a nap in a rural setting. 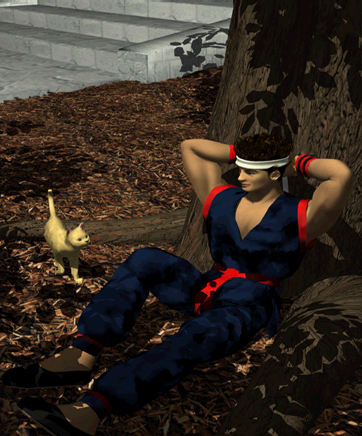 There's also an image of Akira with a kitten! 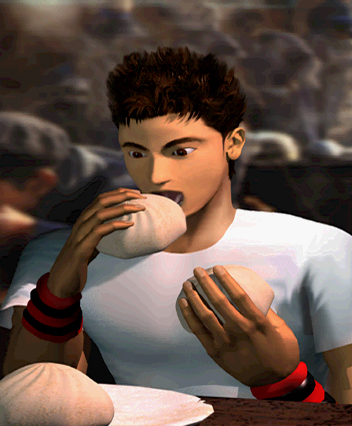 Perhaps Ryo will also need to eat steamed buns / dumplings in Shenmue 3 for stamina? 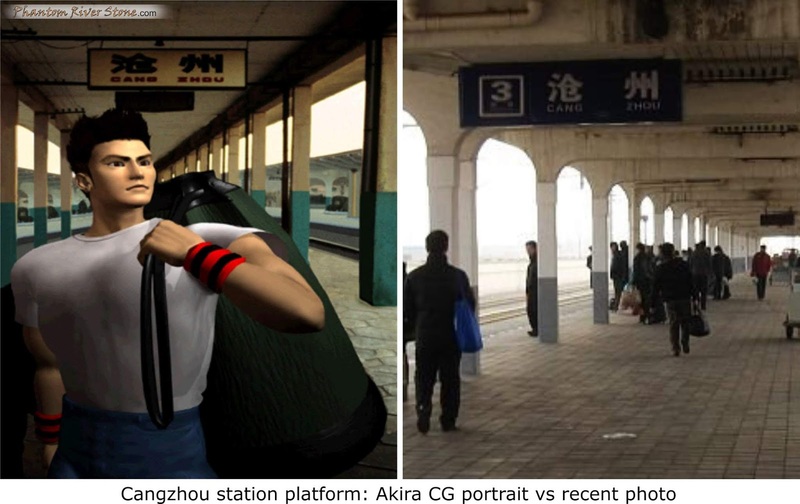 One of the images above in particular is interesting as it shows Akira at a station with the platform sign "Cang Zhou". Shown for comparison is a current-day photo of one of the station platforms. 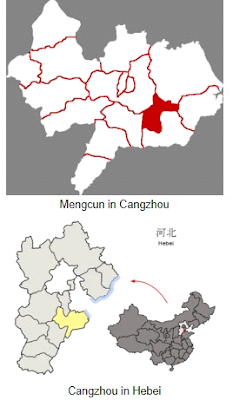 Cangzhou in China is located in eastern Hebei, immediately to the south of Tianjin, near the coast of the Bohai Sea, a gulf of the Pacific Ocean. Bordering prefecture-level cities are Hengshui to the southwest, Baoding to the west, and Langfang to the north. It lies on the Beijing–Shanghai Railway. The city has historically been known in China for its wushu (Chinese martial arts) and acrobatics (specifically, the Wu Qiao school). Most interestingly about this location is that one of the counties of Cangzhou is Mengcun - Shenmue fans will recognize this name from the location that Lan Di alleges Iwao killed his father Sunming Zhao in. Perhaps it would make sense that eventually Ryo would travel to Cangzhou and ultimately Mengcun - hence the station name from the image. Since Cangzhou hasn't been name-dropped so far in locations for Shenmue 3, it's rather unlikely that Ryo will reach this area until much later in the series. 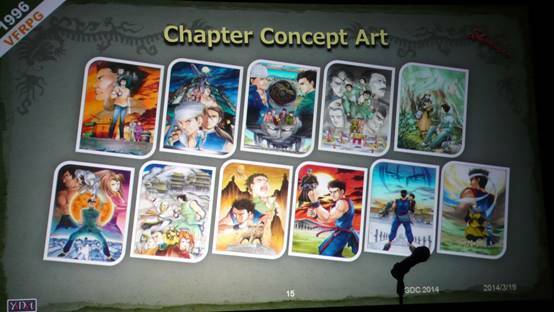 But it's amazing to me to see links to the story arc of Shenmue in concept art for Virtua Fighter from as early as 1995! Pai here seems to have similarities to Shenhua, pig tails and buns in her hair being the most noticeable. In these above shots, we see a rural, farm girl style to her. 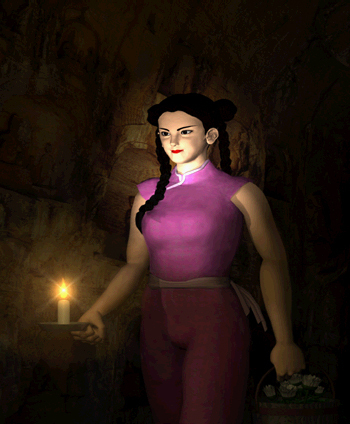 Is the caves image a potential nod towards the stone pits from the end of Shenmue 2? 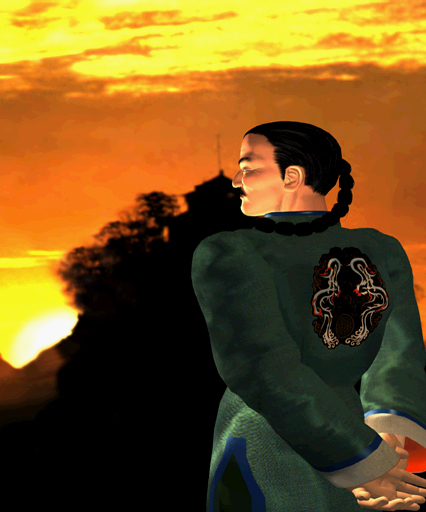 Lau here clearly resembles Lan Di, with his menacing close-ups, and Chinese style robes, one featuring a Dragon on the rear, and a Green robe featuring another symbol (similar to the Chi You Men logo?). A symbol on the back of Lau's garment (CG Portrait image). 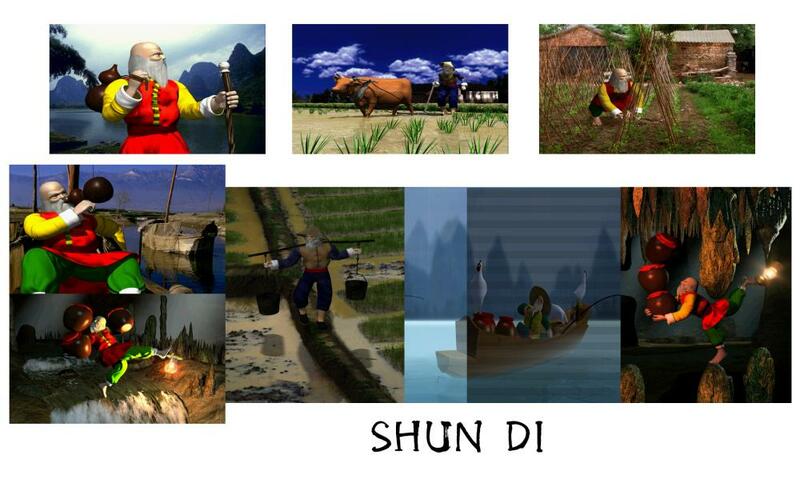 With a name like Shun Di, you'd be easily forgiven for thinking that Lan Di was based off of this character because of the similar name, but upon viewing the concept art above here, it's clear to see that Shun Di is a different character all together. Known for his Drunken Master martial arts style, perhaps this is a character that Ryo may meet in Shenmue 3? The similarities to the old man seen in the most recent Shenmue 3 "Ryo & the Master" are quite striking, perhaps? Could he be a homage to Wolf? 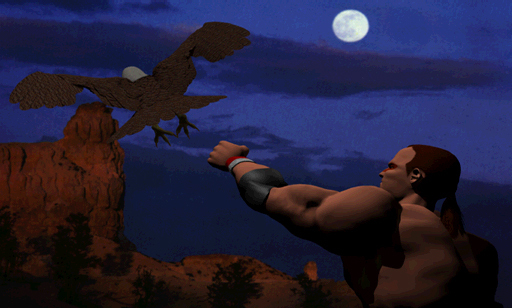 Although the costume of the character in the trailer is that of a Mongolian wrestler (see Part One of our trailer analysis post) while Wolf has a Native American influence, his character might have been used as the basis for this new one. 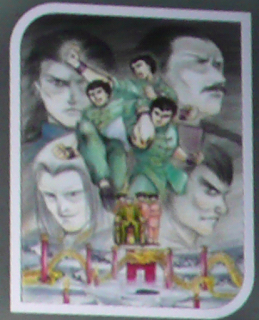 Well, I hope you've enjoyed this look into the early Virtua Fighter CG Portrait series artwork. 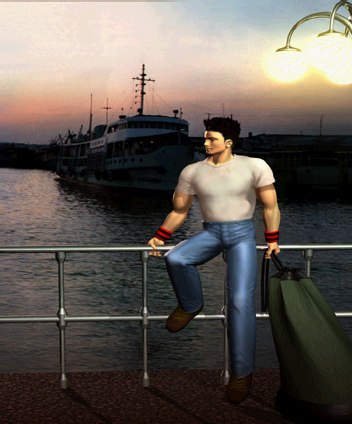 It's always great to look into the history of the series, and what ultimately became Shenmue in some form or another. I'm looking forward to the future of the series to see just what Yu Suzuki has in store for us and what he envisioned such a long time ago! 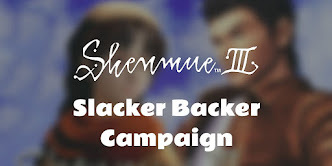 If you would like to view all of the artwork from these discs you can find it here on Shenmue Dojo's media section. I wish to thank Switch once again for letting me provide this content to you all, and I hope it was an interesting and eye opening read! Please share your thoughts and theories below! Thanks so much for featuring my post again dude! Looking forward to hearing peoples thoughts about Cangzhou! Thank you for contributing! Amazing to think that some of the ideas in these images from so long ago ended up being woven into a series that is still ongoing today. Also love the way the CG images have made use of photographic backgrounds (such as the harbor or the train station) which really adds reality to the characters. Wow I really enjoyed reading this. I was curious to more of the Virtua Fighter past background influences on Shenmue and I learned alot more reading this. Thanks. 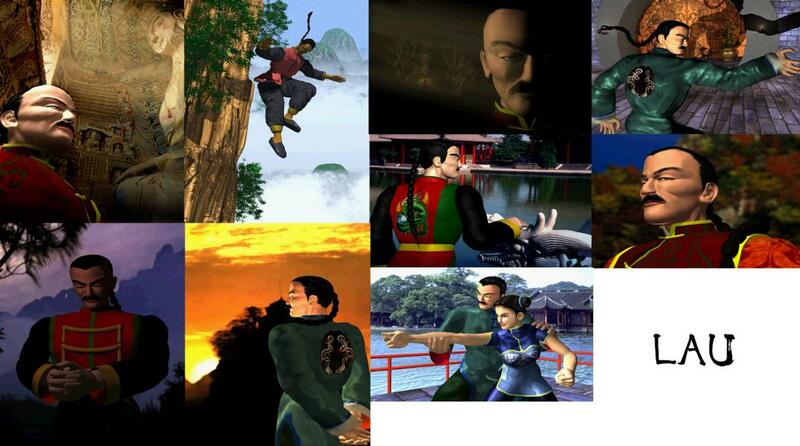 Amazing write up Skill, some of the comparisons drawn to Shenmue using these vintage VG CG renders are quite striking. The one I enjoyed in particular was Akura at Cangzhao! There always seemed to be some form of journey planned for Akura/Ryo via train in China by Yu San, as in GDC tile 3 & also this VF render at Cangzhao Stn you highlighted. I always have been very intrigued regarding this and think it could make for a great in game section of Shenmue, I have my fingers crossed it could be featured in Shenmue 4 or even better as some kind of area transition mechanic in 3.